17 C None No Power Seat 17 C is a standard Business Class seat, however, the proximity to the lavatories and galley may be bothersome. 17 D None No Power Seat 17 D is a standard Business Class seat, however, the proximity to the lavatories and galley may be bothersome. 17 G None No Power Seat 17 G is a standard Business Class seat, however, the proximity to the lavatories and galley may be bothersome. 17 H None No Power Seat 17 H is a standard Business Class seat, however, the proximity to the lavatories and galley may be bothersome. 31 A None No Power Seat 31 A is a standard Economy Class seat whose proximity to the lavatories and galleys may be bothersome. There is no floor storage for this seat during takeoff and landing. The tray table and video monitor is in the armrest, making the armrest immovable and slightly reducing seat width. 31 B None No Power Seat 31 B is a standard Economy Class seat whose proximity to the lavatories and galleys may be bothersome. There is no floor storage for this seat during takeoff and landing. The tray table and video monitor is in the armrest, making the armrest immovable and slightly reducing seat width. 31 C None No Power Seat 31 C is a standard Economy Class seat whose proximity to the lavatories and galleys may be bothersome. There is no floor storage for this seat during takeoff and landing. The tray table and video monitor is in the armrest, making the armrest immovable and slightly reducing seat width. 31 D None No Power Seat 31 D is a standard Economy Class seat whose proximity to the lavatories and galleys may be bothersome. There is no floor storage for this seat during takeoff and landing. The tray table and video monitor is in the armrest, making the armrest immovable and slightly reducing seat width. 31 E None No Power Seat 31 E is a standard Economy Class seat whose proximity to the lavatories and galleys may be bothersome. There is no floor storage for this seat during takeoff and landing. The tray table and video monitor is in the armrest, making the armrest immovable and slightly reducing seat width. 31 G None No Power Seat 31 G is a standard Economy Class seat whose proximity to the lavatories and galleys may be bothersome. There is no floor storage for this seat during takeoff and landing. The tray table and video monitor is in the armrest, making the armrest immovable and slightly reducing seat width. 31 H None No Power Seat 31 H is a standard Economy Class seat whose proximity to the lavatories and galleys may be bothersome. There is no floor storage for this seat during takeoff and landing. The tray table and video monitor is in the armrest, making the armrest immovable and slightly reducing seat width. 31 J None No Power Seat 31 J is a standard Economy Class seat whose proximity to the lavatories and galleys may be bothersome. There is no floor storage for this seat during takeoff and landing. The tray table and video monitor is in the armrest, making the armrest immovable and slightly reducing seat width. 31 K None No Power Seat 31 K is a standard Economy Class seat whose proximity to the lavatories and galleys may be bothersome. There is no floor storage for this seat during takeoff and landing. The tray table and video monitor is in the armrest, making the armrest immovable and slightly reducing seat width. 44 D None No Power Seat 44 D is a standard Economy Class seat that may have limited recline. The proximity to the lavatories may be bothersome. 44 E None No Power Seat 44 E is a standard Economy Class seat that may have limited recline. The proximity to the lavatories may be bothersome. 44 G None No Power Seat 44 G is a standard Economy Class seat that may have limited recline. The proximity to the lavatories may be bothersome. 45 A None No Power Seat 45 A is a standard Economy Class seat that may have limited recline. The proximity to the lavatories may be bothersome. 45 B None No Power Seat 45 B is a standard Economy Class seat that may have limited recline. The proximity to the lavatories may be bothersome. 45 C None No Power Seat 45 C is a standard Economy Class seat that may have limited recline. The proximity to the lavatories may be bothersome. 45 H None No Power Seat 45 H is a standard Economy Class seat that may have limited recline. The proximity to the lavatories may be bothersome. 45 J None No Power Seat 45 J is a standard Economy Class seat that may have limited recline. The proximity to the lavatories may be bothersome. 45 K None No Power Seat 45 K is a standard Economy Class seat that may have limited recline. The proximity to the lavatories may be bothersome. 46 A None No Power Seat 46 A is a standard Economy Class seat that has extra legroom. There is no floor storage for this seat during takeoff and landing. The tray table and video monitor is in the armrest, making the armrest immovable and slightly reducing seat width. 46 B None No Power Seat 46 B is a standard Economy Class seat that has extra legroom. There is no floor storage for this seat during takeoff and landing. The tray table and video monitor is in the armrest, making the armrest immovable and slightly reducing seat width. 46 C None No Power Seat 46 C is a standard Economy Class seat that has extra legroom, however, the proximity to the lavatories may be bothersome. There is no floor storage for this seat during takeoff and landing. The tray table and video monitor is in the armrest, making the armrest immovable and slightly reducing seat width. 46 D None No Power Seat 46 D is a standard Economy Class seat that has extra legroom, however, the proximity to the lavatories may be bothersome. There is no floor storage for this seat during takeoff and landing. The tray table and video monitor is in the armrest, making the armrest immovable and slightly reducing seat width. 46 E None No Power Seat 46 E is a standard Economy Class seat that has extra legroom, however, the proximity to the lavatories may be bothersome. There is no floor storage for this seat during takeoff and landing. The tray table and video monitor is in the armrest, making the armrest immovable and slightly reducing seat width. 46 G None No Power Seat 46 G is a standard Economy Class seat that has extra legroom, however, the proximity to the lavatories may be bothersome. There is no floor storage for this seat during takeoff and landing. The tray table and video monitor is in the armrest, making the armrest immovable and slightly reducing seat width. 46 H None No Power Seat 46 H is a standard Economy Class seat that has extra legroom, however, the proximity to the lavatories may be bothersome. There is no floor storage for this seat during takeoff and landing. The tray table and video monitor is in the armrest, making the armrest immovable and slightly reducing seat width. 46 J None No Power Seat 46 J is a standard Economy Class seat that has extra legroom. There is no floor storage for this seat during takeoff and landing. The tray table and video monitor is in the armrest, making the armrest immovable and slightly reducing seat width. 46 K None No Power Seat 46 K is a standard Economy Class seat that has extra legroom. There is no floor storage for this seat during takeoff and landing. The tray table and video monitor is in the armrest, making the armrest immovable and slightly reducing seat width. 59 A None No Power Seat 59 A is a standard Economy Class seat that is in the last row of the aircraft and has limited recline. The proximity to the lavatory and galleys may be bothersome. 59 C None No Power Seat 59 C is a standard Economy Class seat that is in the last row of the aircraft and has limited recline. The proximity to the lavatory and galleys may be bothersome. 59 D None No Power Seat 59 D is a standard Economy Class seat whose proximity to the lavatory and galley may be bothersome. 59 G None No Power Seat 59 G is a standard Economy Class seat whose proximity to the lavatory and galley may be bothersome. 59 H None No Power Seat 59 H is a standard Economy Class seat that is in the last row of the aircraft and has limited recline. The proximity to the lavatory and galleys may be bothersome. 59 K None No Power Seat 59 K is a standard Economy Class seat that is in the last row of the aircraft and has limited recline. The proximity to the lavatory and galleys may be bothersome. 60 D None No Power Seat 60 D is a standard Economy Class seat that is in the last row of the aircraft and has limited recline. The proximity to the lavatory and galleys may be bothersome. 60 E None No Power Seat 60 E is a standard Economy Class seat that is in the last row of the aircraft and has limited recline. The proximity to the lavatory and galleys may be bothersome. 60 G None No Power Seat 60 G is a standard Economy Class seat that is in the last row of the aircraft and has limited recline. The proximity to the lavatory and galleys may be bothersome. This aircraft offers a 15" inch personalized entertainment system in both cabins, with a selection of approximately 50 movies, 10 games, and a 3D electronic map so you can keep track of your flight's location. The system operates in Chinese, English, and French and is controlled by a handset or touchscreen. Power ports are available at all seats. 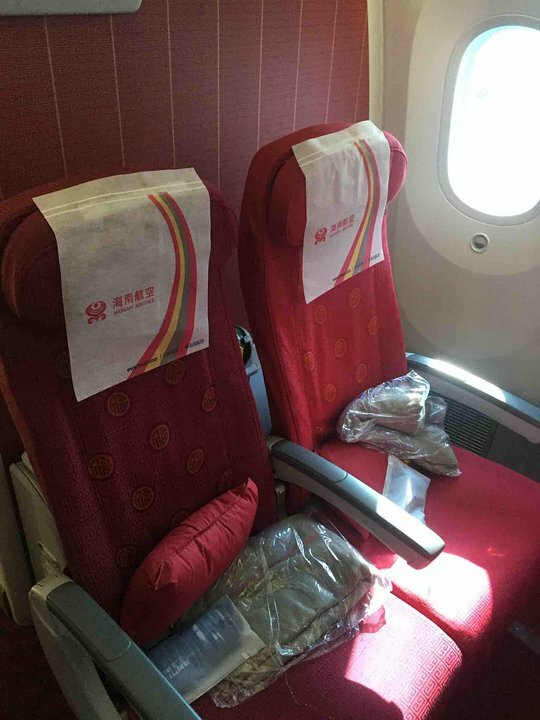 Hainan Airlines' Boeing 787-9 seats 288 passengers with a cabin configuration that features 30 flat bed Business seats and 258 Economy. Flew 33H one way and 34H back. No air vents on the plane, on the way back to had to plug in a USB fan to the socket on the entertainment system, felt very warm the entire time. The entertainment system is also rather bad, poor selection and then everything has hard coded chinese subtitles you cant turn off and everything is edited to comply with chinese censorship which ruins films. The plane had wifi but it was completely unusable, even the airlines splash page for the wifi wouldnt load and i tried 3 devices. The lack of air vents made this the most uncomfortable flight ive taken in a long time. While this seat has ample leg room and easy access to the bathrooms, many people stand in front of it not just to wait for the bathroom but also to chat, stretch out, and exercise. As it is near the exit door, you may need to tell other passengers not to lean on the exit door and hold on to the exit door handle. Since your monitor is under the armrest, the seat width may be slightly narrower and you can't watch entertainment for a while like economy class passengers who have the monitor on the seat in front of them. Overall Hainan provides a very nice in flight experience with attentive flight staff who clean the bathrooms regularly. This is an absolutely brilliant airplane in terms of passenger comfort: 1. The seat is very comfortable, although being lightweight 2. Legroom is great for a 12-hour flight. I did not fell cramped at all despite being 1.8m/6ft tall. 3. The back galley in economy is a great spot for stretching your feet and socializing while drinking and eating a snack. All in all, great experience and insane value for money. 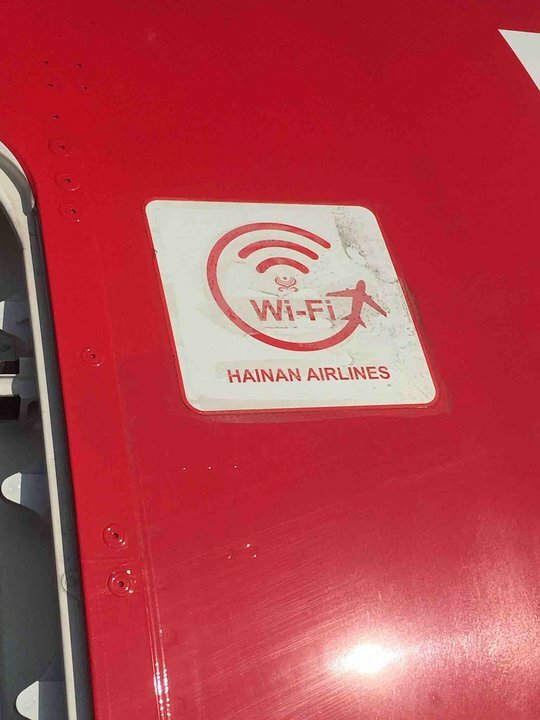 Great job, hainan! Last row of the economy area, a little bit noisy but in general it is okay.BTW, Wifi is available on this aircraft. The seat itself is a fine economy class seat. The 787-9s that I was on from Chicago to Beijing (and back) did not have individual air vents. Thus my experience was that I was quite warm during both flights; not sure if this is true of all window seats or the entire cabin. I even made sure to wear shorts, sandals, and a light t-shirt for the return flight and was still warm. For economy class among three seats, 2 AC power plugs are provided. Under each monitor, there also exist a USB port for charging. Both 17A and 17K are likely the most private seats in the Business Class cabin, as you've got a solid wall behind you, and you're in the back corner. I did notice that the lavatories directly behind 17A is a large, Business Class lavatory, that unfortunately, was overrun by Economy Class passengers. Hainan Airlines flies 1 versions of Boeing 787-9.